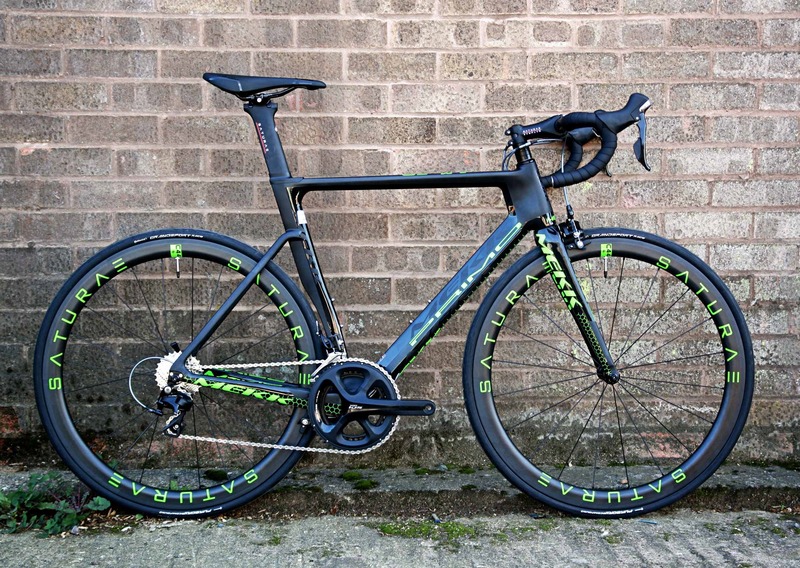 Awesome aero performance in an astoundingly affordable package – ideal for the budding racer or fast sportive rider. Fantastically quick and packed with innovative aerodynamic features. While relatively new to the bike market, Mekk Bicycles have carved a strong niche in the UK market with their mix of high performance frames, quality component specification, and affordable pricing – head to any sportive HQ over the last few years and there’s a good chance you will have seen a good few Mekk’s kicking around amongst the more established brands. Based in Bristol and designed in the UK, Mekk have two cycling industry heavyweights behind them in Mark Edwards and Ken Knight (the ME and KK which form the brand name). Between them, Mark and Ken have over 50 years of experience at all levels of the bike industry and it’s this level of knowledge which really sets Mekk apart, with a razor-sharp focus on rider satisfaction and what they term affordable performance, by combining a high-quality frame and fork with the best suited components. The Primo is the aero bike in Mekk’s stable and, boy, does it look it. Recently overhauled, the goal with the current Primo was to increase stiffness without sacrificing a smooth and comfortable ride – a potentially tricky balancing act for a bike with such a racy demeanour. Exclusive to Rutland Cycling, we took the 2018 Primo 6.2 for a spin to see how Mekk have fared. The Primo’s frame is certainly eye-catching – all straight lines and sharp corners – while the matte and gloss black base with neon green highlights really makes it jump out. And let’s be clear, it looks very, very fast. 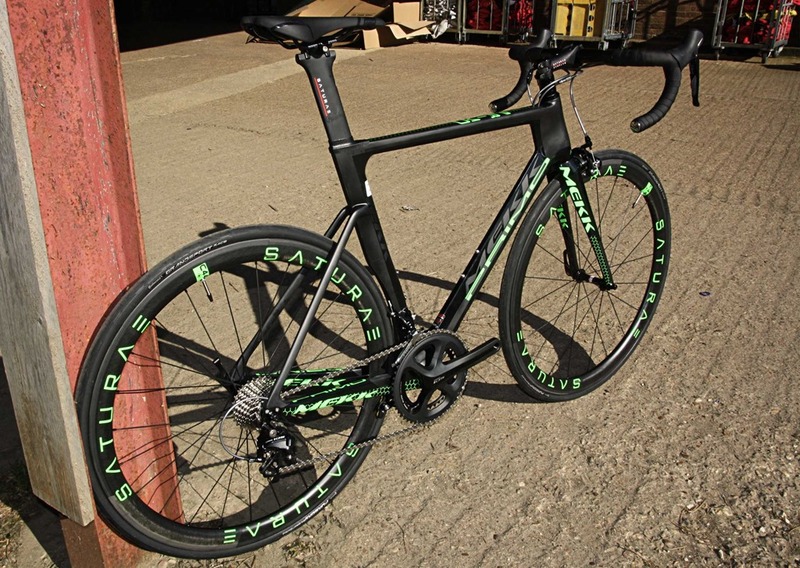 Littered with all the features you’d expect on a high performance aero bike, and with a very narrow profile throughout, Kamm tail-profiled tubes, dropped seatstays and an aero seatpost, this looks like a bike built for speed. 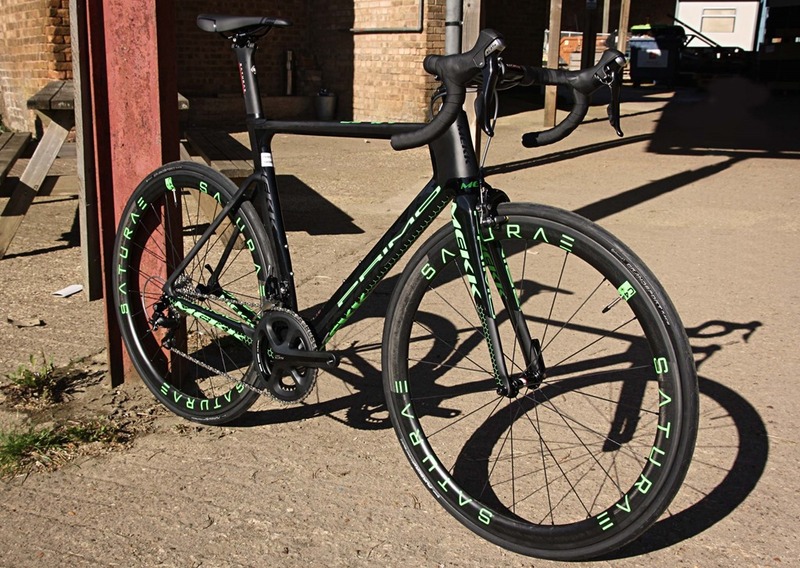 Aesthetics aside, the frame and fork are constructed from high modulus Toray T800 carbon, so should provide a good blend of stiffness and comfort. The geometry is unashamedly racy with a short head tube and lengthy top tube, but a cutaway hugging the rear-wheel keeps the wheelbase short. The Primo 6.2 comes with Shimano’s 11-speed 105 groupset, a solid performing gruppo which represents just about the best value for money available when it comes to shifting and braking. 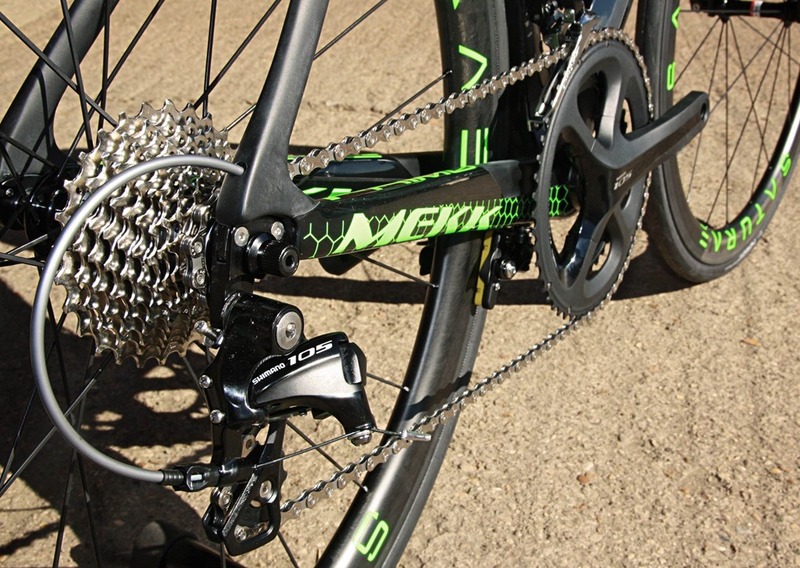 Mekk have opted for a 52/36 chainset which is well suited to the Primo’s purpose, and the 11-28 cassette should provide enough range for most riders. In a nod to aerodynamics all the cables are internal, entering the frame behind the stem via the top tube, and the rear brake is moved out of the wind and under the bottom bracket. The wheels on the Primo really stand out. Provided by Saturae, Mekk’s in-house brand, the 50mm full carbon wheelset is almost unheard of at this price point and immediately puts the Primo a rung above similarly priced competitors. The matching green decals are a nice touch too. 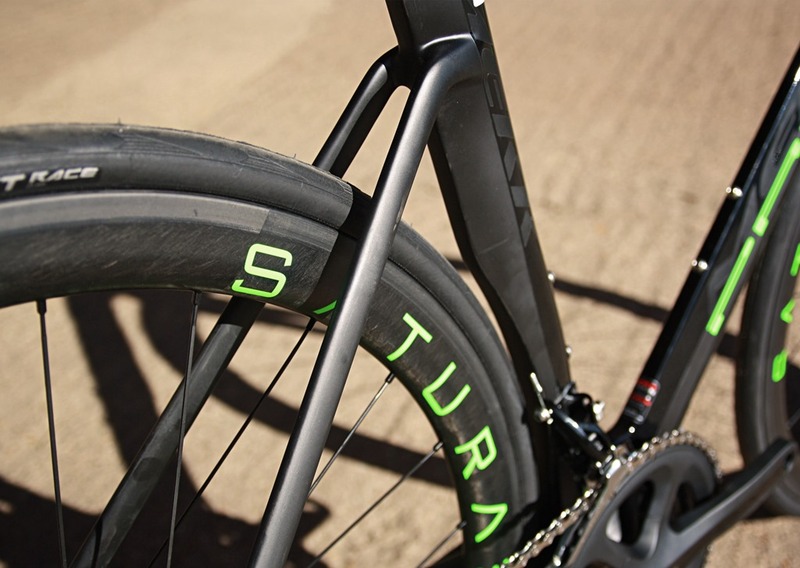 Also provided by Saturae, the bars and stem are fairly standard alloy affairs but do their job with minimum fuss. 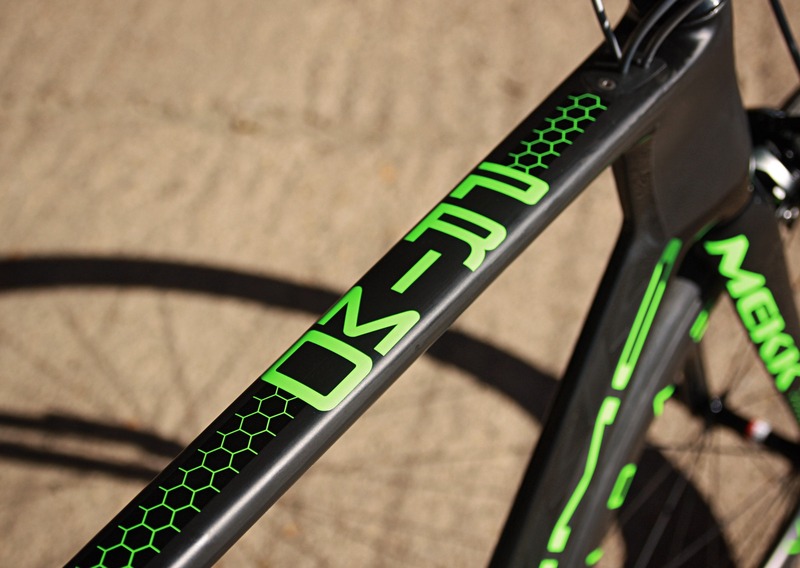 The carbon fibre aero seatpost is topped by a San Marco Era Start Power saddle. First impressions of the Primo are that it offers a lot more comfort than you might expect from such an aero-oriented frame. Ok, it may not be the completely cosseted ride that you might get from a more endurance focused model but the frame managed to smooth out all but the worst bumps and combines it with the sharp handling that you’d expect from the short wheelbase. We can’t quote any wind tunnel stats but the Primo certainly feels fast once you whip it up to speed. With the short headtube you’re encouraged to tuck up and eek out some extra watts and the handling is responsive without being twitchy. There’s a feeling of almost instant response to rider input which makes this a real laugh to ride – it definitely gave us a hint of over confidence in our own ability when it came to punchy hills! The full carbon 50mm wheels are a real highlight too. They spin up to speed quickly and once you get up to around 18-20 mph they sustain their speed well. Despite carbon braking surfaces having a bit of a bad rep, the braking on the Saturae’s was solid in the dry, although we didn’t have the chance to test them out in the wet. There might have been a hint of flex under really hard out of the saddle efforts but otherwise they were mightily impressive (plus they look the business). The Primo 6.2 is, quite simply, a really fun bike. If you like going fast, then this will certainly put a smile on your face and we were pleasantly surprised by the amount of comfort it offered. For the money, it represents great value and would be as at home on the start line of the local crit as it would on a day-long sportive.